Today Buku Music & Art Project released the lineup for their 2019 event and it is outstanding. With headliners such as Lana Del Rey, Excision, A$AP Rocky, and GRiZ, that’s enough to bring in a massive crowd. But there’s one headliner on the lineup that no one expected – Dog Blood. Dog Blood is a duo consisting of none other than Boys Noize, and Skrillex. Yep, you heard that right. This is the first 2019 lineup announcement that has Skrillex in the mix. That’s a huge move by Buku, and just the cherry on top of the rest of the incredible lineup. On top of that, Getter is presenting his Visceral project at Buku to highlight his newest album and sound. So many amazing music opportunities, the list can go on and on. Buku Music & Art Project has so much more than music to offer attendees. With half the name being dedicated to art, you can imagine the event has endless opportunities for attendees to interact. Amongst the numerous stages the event has, one is specifically dedicated to art and music. Named The Front Yard, festival goers can listen to some sweet sounds while also experiencing eclectic art pieces. There’s so much to experience throughout the span of this two-day event. 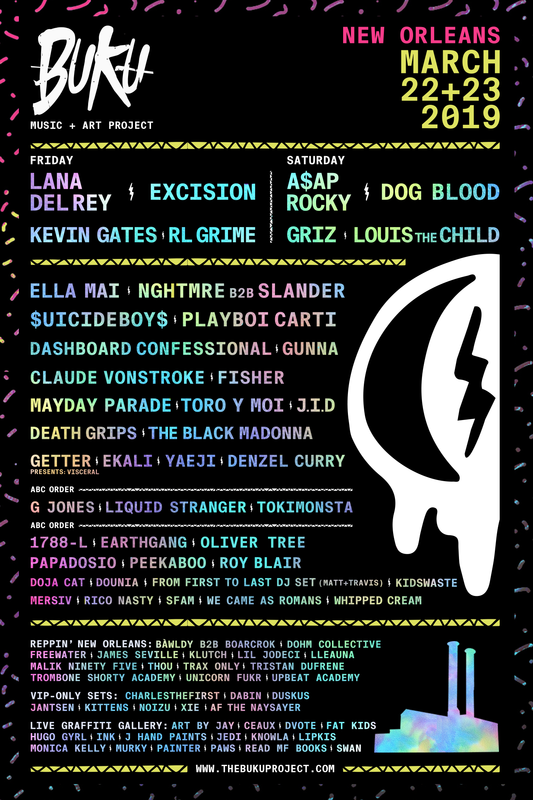 Buku Music & Art Project takes place March 22 and 23 in New Orleans. This festival is a must, so be sure to keep an eye out for when tickets go on sale on December 11th! Check out their website for more details to learn even more about this amazing experience. Last but not least, behold the beautiful lineup below.